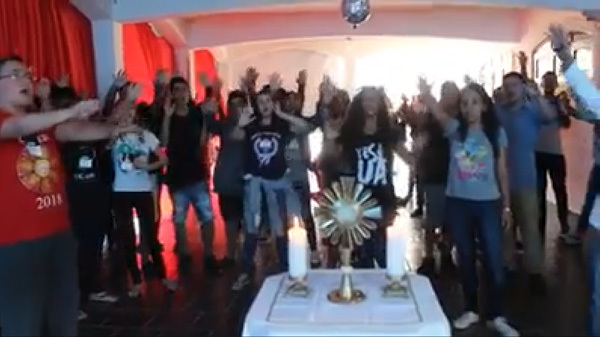 The photo above, as well as the two gifs below, show an eucharistic adoration promoted by members of the movement Canção Nova (New Song) in Brazil. The adoration took place in Our Lady of the Rosary Church, Diocese of Mogi das Cruzes, São Paulo. It is inspired by the Catholic Charismatic Renewal, which is an adaptation of Protestant Pentecostalism to the Conciliar Church following the guidelines of New Evangelization. The group Canção Nova, born in Brazil, has a radio and TV station and has become a powerful media outlet for youth. It expanded and today is present in several countries including the U.S., Italy, France, Portugal and Israel. It exercises its "mission" by means of camping trips, pilgrimages and prayer group meetings, such as the one shown on this page. Like the Charismatic Movement, Canção Nova adopts Protestant rituals such as "encounter with Christ" and "baptism in the Spirit." Its prayers and songs also abound with terms that, although legitimate per se, are used ad nauseam by Protestants, such as Maranatha, hosanna, alleluia. In 2008, this movement was recognized by Pope Benedict XVI.